I remember hearing the Gordon Lightfoot song when I was about ten or eleven years old. 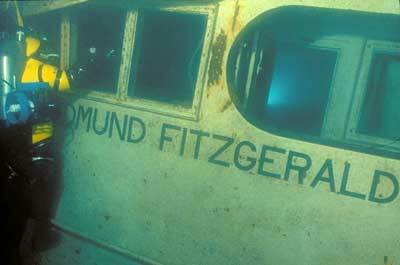 It’s kind of burned into my memory so every time I see something about the Edmund Fitzgerald, I perk up a bit. I found this site with recordings of the banter between a boat captain and the U.S. Coast Guard at the time the Edmund Fitzgerald went down. It’s very moving and a little bit creepy to listen to, knowing so many people lost their lives. I had been looking for information about Great Lakes wreck diving in general, as I would like to arrange a trip there, possibly next Summer. At about 520 feet down, the Edmund Fitzgerald is out of reach of most technical divers, so it’s one site we won’t be diving. It’s such a tragedy, I don’t know that I’d want to. Then again, given the opportunity, I think I would go. This entry was posted in Dive Sites, Dive Travel, Diving News, Technical Diving and tagged scuba, shipwrecks, technical diving.